Initially when Philip Morris International (NYSE: PM) was spun off from Altria (NYSE: MO) in 2008 it was envisaged that the former would represent the “growth” portion of the pair whilst the latter would be a stodgy dividend payer confined to the domestic tobacco market. Basically shareholders would be able to harvest the extremely high quality profits from Philip Morris USA, using it as a vehicle for collecting gobs of cash as the outlook for the American tobacco market was one of continual decline. The great thing for would-be investors about that kind of outlook for Altria’s core market, plus the volatility of the financial crisis, was the absolutely crazy market discount on the shares. At the start of 2009 Altria stock was trading at $15 per-share on forward earnings of $1.54 per-share. That puts them at under 10x annual earnings. In addition you would have been looking at a dividend of $1.32 a share – equivalent to an 8.8% yield. I think that’s as close as you’re ever going to get to guaranteeing double digit forward returns even with a conservative scenario. In the following years the company has seen its earnings-per-share grow to $2.67 as of fiscal year 2015, with this year’s figure set to be around the $3.00 mark. Overall that works out to compounded annual EPS growth of 10% a year. The dividend, which should come in at $2.35 a share in this financial year, has risen by 8.6% per- year. The interesting thing is that the narrative was by-and-large spot on; smoking rates are continuing to decline in the Unites States. A decade ago about 20% of the US adult population smoked. Today the figure is around 16%, and the same falling trend is in place among younger smokers too. What the company have been able to do is exploit the huge pricing power on brands like Marlboro, which has about 45% of domestic market share, to offset declines. Throw in stock buybacks and productivity gains to juice margins even further and what you’ve seen is serious growth in tobacco stock terms. This is the beauty of investing with low expectations in high quality stocks: it’s turbo charged dividend investing. Revenue growth has been about 1.3%, whilst the combination of factors above has delivered compound earnings growth of 10% a year. Yet the stock’s total returns have been around 25% per-year since the beginning of 2009. Compare that situation to the one of Philip Morris International. At the start of 2009 you find the stock trading at a price of $43.50 a share. Annual earnings come in at $3.24 per-share, giving the stock a then forward valuation of 13.4x earnings. In addition the company was on course to pay out $2.24 per-share of those earnings in dividends – representing a 5.15% yield on the investment price and a 69% pay-out ratio of net earnings. 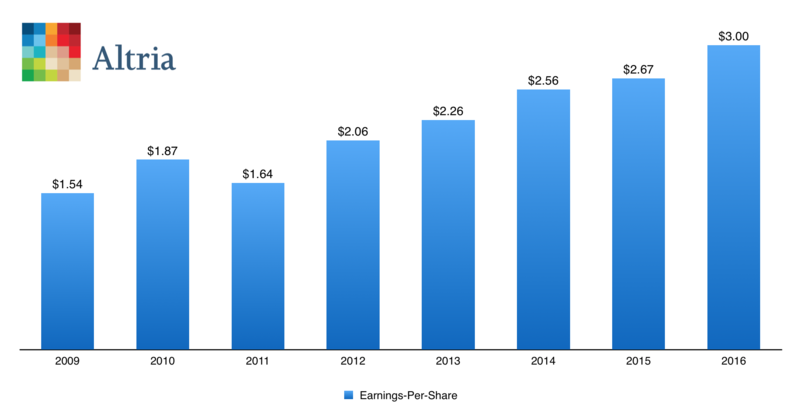 In the years that follow earnings rise to $4.42 per-share by 2015. This year they will be around the $4.55 per-share mark – equivalent to compounded growth of 5% a year. So to sum up you’ve seen earnings growth of 10% in Altria compared to 5% in Philip Morris International, despite the lower growth tag on the former after the spin-off. All in all if you’d have made two equal investments of $10,000 at the start of 2009 you’d have been $33,850 better off in Altria compared to Philip Morris International stock assuming reinvested dividends. This is a great little example of value and market expectation. It’s not even that Philip Morris wasn’t attractively valued back then, just that the huge discount that was applied to Altria stock in the early years of the spin-off meant that it was basically set-up to outperform given their subsequent business performance. In any case let’s be honest, you aren’t exactly going to be kicking yourself if you held Philip Morris International over the last seven/eight years (and many investors will have continued to hold both after the spin off). You were sill in a scenario where you would likely end up with great investment returns, even with very conservative parameters about the future performance of the business (and that’s exactly what happened). The 2009 dividend of $2.24 per-share has grown by 9.1% a year to the current annual distribution of $4.12 a share. Total returns have been 13.9% a year assuming you allowed the dividends to accumulate and 15.6% a year if they were reinvested. I’d imagine that income investors harvesting a 9.5% yield on cost from an investment made in a stodgy blue chip dividend stock in 2009 won’t be feeling too hard done by. The flip side to those returns is that right now these stocks trade at some of their highest valuations in decades. As stated above, in the past you could construct very conservative scenarios for future business performance and still come out with great returns because the market discount was so generous. That’s no longer the case at these valuations. Altria stock is trading somewhere around 21x annual earnings. Let’s say you project lower annual earnings-per-share growth of 7% compared to the 10% rate seen over the last eight years. Over a ten year spell that would mean Altria posting earnings of $5.90 a share by 2026. 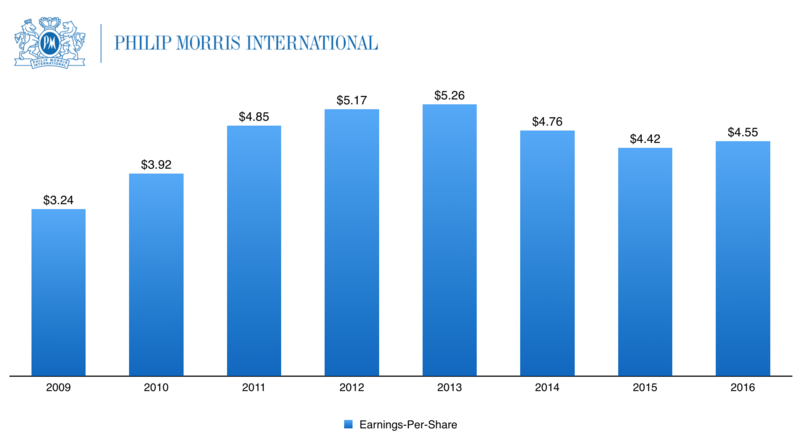 The average valuation after the spin off of Philip Morris International is about 15x annual earnings. That means that if you were to take that as a base valuation then it would imply a stock price of $88.50 ten years from now compared to the current price of $64.70 a share. Throw in cumulative dividends of $35 a share between now and then and you would be looking at annual returns of 6.7% a year. Now let’s do the same for Philip Morris International. At the moment the shares are trading at that same figure of around 21x annual earnings. The average valuation post the spin off is 16x earnings and we’ll assume it ends up there again. Now a major part of the reason why earnings growth has been hit recently is because of the currency headwinds of reporting in US dollars but deriving all of your sales from outside of the United States. At some point that headwind will subside and currency movements will end up becoming a tailwind to earnings but for the sake of being conservative let’s stick to 5% a year growth. The current dividend is already around 90% of net earnings so future growth is somewhat constrained – let’s say at 4%. That would deliver annual returns of 6% out to 2026. So what does it all mean? Well, to the extent that there’s ever really a not-so-good time to buy the big tobacco stocks I’d say that this is it. In the past investors have basically been treated to a prolonged spell of very favourable valuations to the extent that you could have invested at pretty much any point and locked in great returns. There was very little risk on the value side of things which is no longer the case. That’s not to say the shares will necessarily provide poor returns from here. It could well be they continue to see these valuations ten or twenty years down the line (e.g. imagine a scenario in which interest rates remain at record lows). If that were to be the case then reinvesting plus some modest earnings growth would provide decent returns. It’s just that anyone buying right now is losing that historical margin of safety provided by low valuations.